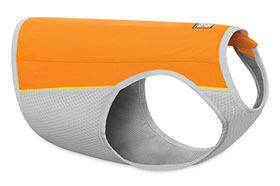 The Ruffwear Swamp Cooler provides protection from the sun and cooling through evaporation. In warm climates, dogs typically stay cool by seeking shade and moving to cooler areas. The Swamp Cooler allows dogs to perform in hot climates. To activate the Swamp Cooler, soak in water, wring out and place on your dog. The light colored fabric reflects solar radiation, while evaporative cooling pulls heat from the dog. 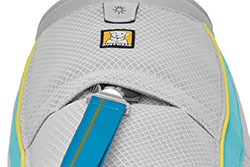 The integrated leash portal allows leash attachment with most harnesses.